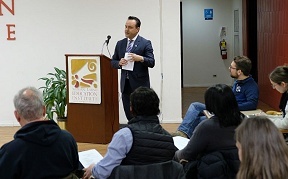 Alderman Cardenas joined the McKinley Park Development Councils first meeting of 2018 at the National Latino Education Institute, 2011 West Pershing, on Wednesday, January 17th, 2018. The alderman has been instrumental in the revitalization of the McKinley Park neighborhood from energizing the McKinley Park Advisory Council to millions in infrastructure and now with the MPDC. In summer of 2017, Alderman Cardenas presented a business proposal to create market rate and senior living units at historic buildings at 2139 and 2159 W. Pershing Road. The proposal was the catalyst for the MPDC as they chose a possible manufacturing development over CHA and outsiders moving into the neighborhood. Alderman Cardenas continues to believe that McKinley Park should remain open to all looking for its great amenities yet jobs in manufacturing are critical. Since Alderman Cardenas received McKinley Park in the re-map more jobs have been created on Pershing in 4 years than in 20 years with lighting companies, a school, a music company and just a few blocks away the new Archer Mall. The Alderman supported the formation of the MPDC by contacting CMAP, the CDPD and writing letters of support.